Annapurna Base Camp is the famous trekking destination in the mid Nepal. The base camp of Mount Annapurna (8093m) is the tenth highest mountain peak in the world and the eighth highest mountain in Nepal. Thousands of trekkers visit Annapurna Base Camp every year. This is the most celebrated trekking route in Nepal. Reaching to the base camp of Annapurna on foot by walking is not easy. Although everyone may have high desire to reach the base camp and explore the high Himalayas, enjoy the beautiful mountain peaks and landscape. So it is possible in easy way by flying to Annapurna Base Camp by a helicopter ride. When to Join a Helicopter Tour? Annapurna Base Camp Helicopter tour is possible in low budget is by joining in a group joining helicopter tour. Charter flights to Annapurna cost about 2000 USD per flight from Pokhara which can accommodate maximum 6 persons. If you are in group of 4-6 persons, then charter flight cost on the sharing basis will be very low. So joining with other in a group joining helicopter flight is best way to explore the Annapurna mountain range by helicopter ride. If you have very limited time about 1-2 days free in Pokhara and want to reach to the snowline place, the this group joining helicopter is the best and only one option. 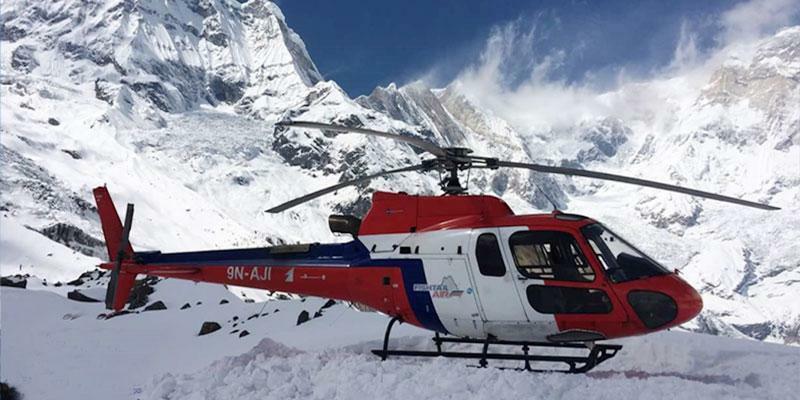 Sharing the charter helicopter cost, you can enjoy the aerial views by helicopter ride and reach at the base camp of Mt Annapurna and return within an hour. Group joining helicopter tours are schedule on daily basis from Pokhara. If the weather and other conditions is perfect then helicopter flight to ABC from Pokhara on group joining basis is possible. You just need to share the cost of charter flight by number of persons interested on helicopter ride. If you want to join for the heli tour, just contact us by a phone call or email. Normally helicopter tours are available daily. If you want to join, please call us before 2 days to book a seat. You just share your date when you want to fly, then our team will follow you with necessary information. You need to follow these steps to fly like a bird by helicopter from Pokhara to ABC.